Sorry for the delay in posting, I have been busy eating…everything. My Babci is gonna be 86, so she basically has mastered everything there is to make. She does have some specialties, and I am a fan of both (well, technically all 3). The first one is Goblacki (say it with me “go-wump-gee”). It’s cabbage wrapped around ground beef with some spices and rice in a tomato soup gravy sort of sauce. To get good ones is good, to get those is awesome. I’m not gonna lie, there sometimes is hand stabbing for the last ones. My grandpop is quick with a fork. Along with that is stewed cabbage made with the leftover cabbage leaves. It is what it sounds like, stewed cabbage with tomato and a little flour and butter thickener to pull it all together. Together, these things give you a picture like this! Some people eat it with a little ketchup and some don’t. My Cioci Marion makes them with pepper so they have a great zip to them. Babci’s are more mellow but still great. I look forward to St. Patty’s Day every year because that seems to be the only time of the year when cabbage is on sale. It is also when I get to hear stories about when it was 1 or 2 cents a pound, as opposed to the sale price of 17 cents once a year. 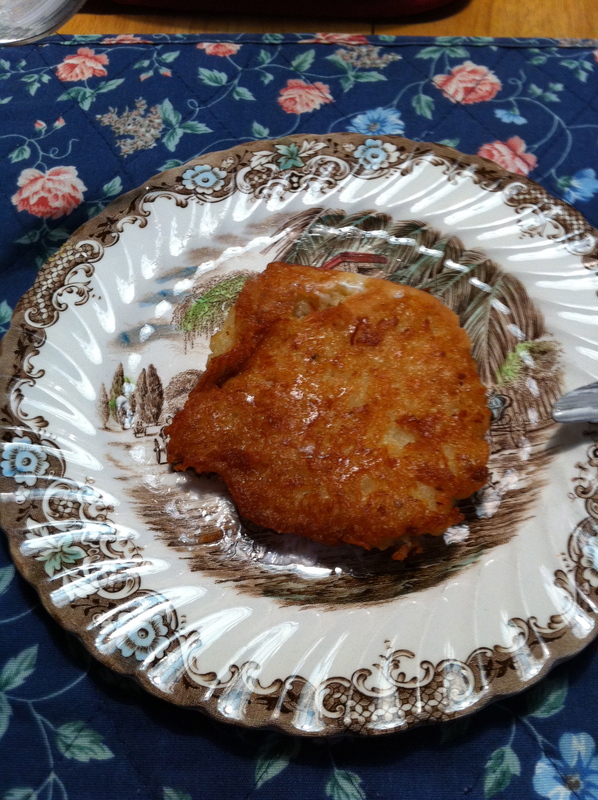 The other specialty that she makes that make me drop whatever I am doing and abandon any ideas of a diet are Platskis. 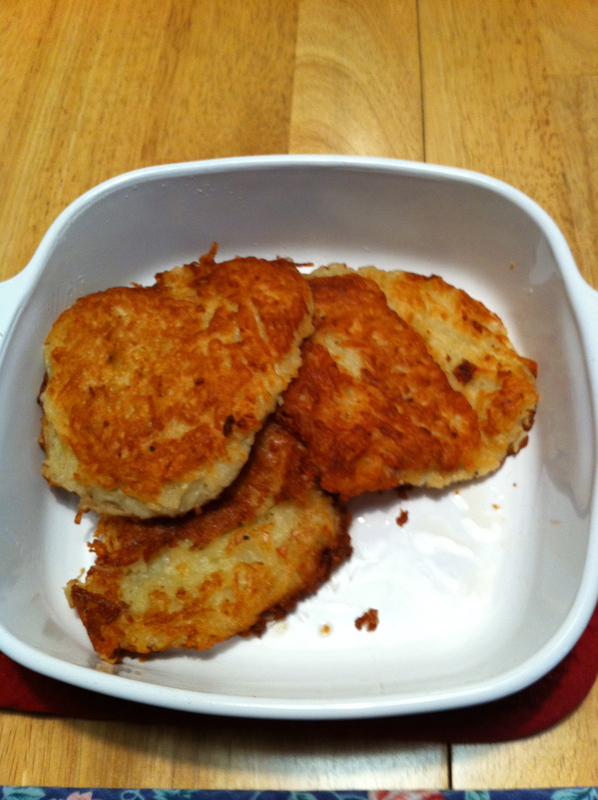 Some people call them Bylinis or Latkes, but us Poles call them Platskis: fried potato pancakes, with a ton of sour cream! Sometimes they can be oversaturated with grease and, trust me, you don’t want that. It turns into a bowling ball of lead rolling it’s way through your system, and that’s no dance party usa. Luckily, I don’t have to worry about that, as Babci gets them right every time! Deliciously crisp on the outside and fluffy on the inside, it again inspires lots of hand stabbing. And then you get this on your plate! I spared you the sourcream shot. So good, I want one now. 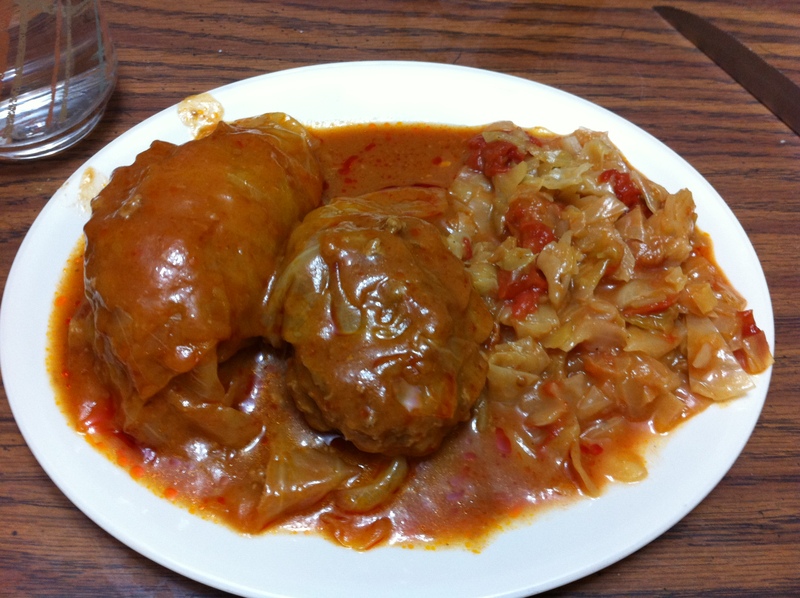 Posted on March 26, 2011, in home cooking and tagged babci, goblaki, polish food, stewed cabbage. Bookmark the permalink. Leave a comment.